Here's a drawing I've been working on for MONTHS only because it has had to take a back seat to all my commissions and I only had the chance to work on it infrequently. I still plan on putting some kind of background to this piece, but what, I don't yet know. For now, I shall consider this piece finished reserving the right to add a background later on and then calling it complete again! 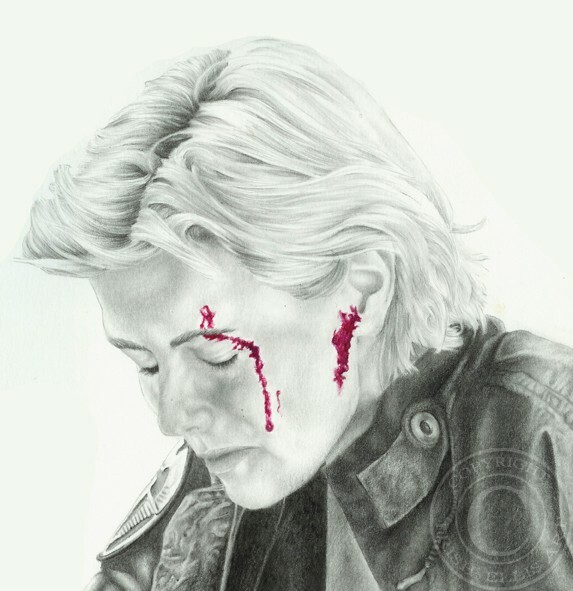 LOL Incase you don't recognize this tv character, it's Lt. Col. Samantha Carter from Stargate SG1 having a bad day! Can you guess what episode I got the screencap from to use as a photo reference?? Original size is 9x12 done in pencil and prisma colors pencil crayons on Strathmore acid free bristol. I can't tell...but You really know how to Capture Moments in television..Great Pose,and the splash of Color Reaches Out at Me!